First, let me say that a more complete biography of my Aunt Edna “Ed” Gray will be presented in Part II: “Faith, Family, and Education,” including some of my wonderful memories of her. Part III: “Memories of my Parents,” shares some of Edna’s fond recollections of her home life. But, do allow me to explain at the outset how I came to learn of her broad literate background as well as some of her interesting experiences. 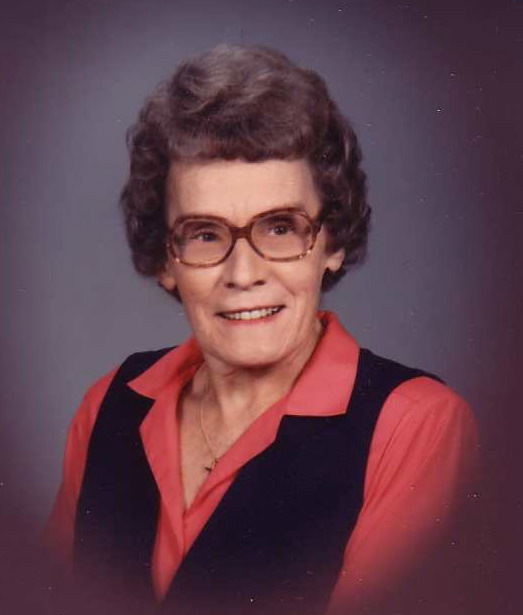 After she died in 1997, Aunt Ed’s personal effects were distributed as per her wishes to various members of the immediate family, including a box of notes, mostly genealogical in nature. Some years later, I had been writing a brief biography on the life of her brother Merle (1927-2013) and was given this box of notes to see what I could make of it. After a cursory review of the material, which true to Aunt Ed’s nature, consisted of many small scraps of paper copied onto other small scraps of paper and all clipped together. There were carbon copies of letters of inquiry to several distant relatives and other responses from many of the same relatives. She, indeed, seemed to be the only one in all the Gray-Campbell families keeping their history alive. To make a long story short, I cited some of her information in those early days of my work and let the rest sit in a dark corner of my office. To be honest, I was mostly concerned that she, as I, was in search of our earliest Scots-Irish ancestors, always a prize for genealogists. I believe that written evidence shows my great-great-great grandparents to have been James and Mary Patterson Gray, and so did she at one time before crossing them off her many lists and going in another direction. Just this summer my research led me to an ongoing project involving several other James Grays of early 19th century Western Pennsylvania. So, almost 20 years after her death, I decided to revisit Aunt Ed’s notes and listen to what she had to say about our ancestors. To my amazement, she’d been saying many things that I missed the upon first hearing, and much more. 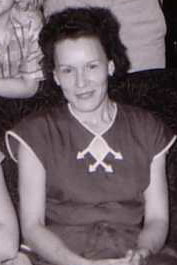 I have decided to share some wonderful, heart warming stories from her life and times as well as one absolutely incredible tale of what could only be described as an “adventure.” In fact, this tale ends with what Aunt Edna refers to as “a Divine Miracle.” The story is so compelling that I’m starting this series with it. Although Aunt Ed intended to complete, before her death, what she called, “A Memoir of Appreciation for the Lives of my Beloved Parents: Bertha Campbell & Paul B. Gray,” I have only found a few short stories from that Memoir, and I will share them in future parts along with personal reflections, poetry, and a short autobiography from her life. I’ve even found some pictures that I think you’ll enjoy. So, let’s begin! [Edna: Having graduated from high school in 1938 and worked for several years as a caregiver for some local families and as an aide in two local institutions, I was about to experience a new direction in my life.] In late August 1941, Mother called me to say that I was needed for a two-week stint as a secretary. A neighbor, Eleanor Strain, who worked at our local Freeland Nursery, was to go on her annual vacation. The experience during those two weeks was a decisive turning point–I at once knew an intense secreterial training course would fit me for the business world that seemed to beckon me, somehow. I never regreted the decision and loved every minute of the 18-month training course and job experiences that followed. Mrs. Ehmer had called the BBC late that summer to request a student-companion, secifying three trequirements: 1. The young lady must be at least 21 years old; 2. She must have 2 years driving experience; and 3. She must be willing to attend St. Mark’s Lutheran Church with her. My class of 120 students at BBC were all recent high school graduates. I was the only student over the age of 21. I had been out of high school 3 years and had had a driver’s license since I was 19. In addition, I was very familiar with the Lutheran faith, having worked at St. John’s Home and attending St. John’s Church in Mars after high school graduation. [I was a perfect fit for Mrs. Ehmer’s needs.] I continued to live with Mrs. Ehmer right through graduation from BBC in April 1943. My first job out of business school was at Union National Bank. Two months later I accepted a Civil Service position with Civilian Personnel of the War Department at the U.S. Army Deshon General Hospital in Butler. Although I resigned that position effective September 2, 1945 (VJ Day), I had accumulated enough annual leave to make possible my retention on payroll until the end of November of that year. On November 14, 1945, Mrs. Ehmer and I left for Florida to spend the winter. With the War over, gasoline was again available, and she had looked forward to the trip. Day 1, Wed, Nov 14: At noon, Wednesday, we left Butler in a cold rain, wet leaves everywhere. A map from AAA directed us to the Pennsylvania Turnpike at Irwin to Breezewood, south on 126 to Winchester for overnight. As we parker on the tree-lined street, the soggy fallen leaves were almost knee-deep. The old Victorian mansion, with beds so high we used a step stool to reach the downy-soft mattress, proved a haven on the inky black night. Day 2, Thurs, Nov 15: Leaving Winchester via Route 11, we stopped at the Natural Bridge to see that magnificent sight. At Roanoke, Route 220 brought us to Ashboro, NC, for overnight. Day 3, Fri, Nov 16: Continued on Route 220 to Cheraw, SC, and took Route 1 South to Louisville, GA, for overnight. Weather now beautiful. Warm, clear starry night. Awakened early with the song of the mockingbird coming from every tree. We stayed in a lovely modest southern home, but recall folks were not concerned with “dust” on the furniture. Day 4, Sat, Nov 17: Left Route 1 at Jacksonville, FL, and on to Ocala via Route 301. Overnight a Ocala in the “Florida Hotel” – a small, pretty stucco, one-floor building with arches arounda narrow veranda. Parking lot was across the quiet street. The room seemed to have connecting baths which were shared by occupants in rooms on either side. We had to share with two servicemen. Navy fellows, I think. Ocala is (or was) a lovely, quiet, small country town, and we found it so pleasant and friendly on a stroll up Main Street during the warm “summer” evening. It appeared all the country folks came to town for Saturday shopping and the bright lights. Later, I went to the car in the parking lot to get oranges for a bedtime snack. In the process of relocking the car and juggling fruit, one orange rolled under the car, which I retrieved the next AM when leaving the lot. Day 5, Sun, Nov 18: We checked out of the hotel at 8:30 AM for the final lap of our trip to St. Petersburg, about 130 miles. About 9:00 we stopped at a small coffee shop for a light breakfast with “yesterday’s” donuts. On our way again at 9:30, taking Route 41 to Tampa, a lap of 100 miles with 30 more to St. Pete. Route 41 was a 4-lane highway with raised cement medial strip, very straight and so level one could see for miles ahead. The country appeared quite desolate and barren: no buildings or towns, and since it was Sunday, little or no traffic. I drove back onto the highway and sped away. (I should mention that he continued to sit in his car, no doubt undecided what to do next.) Next, I saw him coming up on us at a high speed, and again I determined not to exceed 65. This time he stayed in the passing lane about a car-length behind, waving a pistol out his window aiming in the direction of our tires. I said to Mrs. Ehmer, “He has a gun and may shoot our tires. We have to stop.” Next is truly a Divine Miracle. When I pulled back on the highway continuing south, I observed him make a “U” turn across the medial strip and head back north. 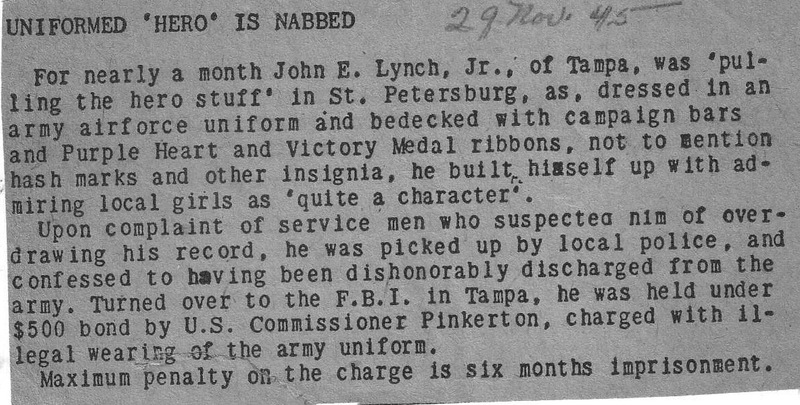 (He may have anticipated we would report to Tampa Police and did not want to be in the area.) We arrived in Tampa about 1:00 and stopped for a quick lunch. I recall having a toasted cheese sandwich. We still had about 30 miles to St. Petersburg over Gandy Bridge, a seven-mile stretch over Tampa Bay. We had reservations at the Central Hotel in St. Petersburg. After checking in, Mr. Thorne, Manager, went with me to put the car in the hotel garage. It was about 3:00 by the time we were settled in our room. I plugged in a small radio we had brought. As I sat down in one of the chairs (Mrs. Ehmer was already sitting. ), I said to her, “What do you think that guy really wanted this morning?” It may seem strange, but it’s a fact, this was the first time either of us had mentioned the incident. Later when reflecting, it seems almost incredible that neither of us thought of reporting the event to the police. (Nor did we mention it to Mr. Throne.) In my own case, I believe my mind was so taken up with the reposnsibility of the trip, directions, safety, etc., that there was just no space left for one more concern. Hence, a total blockout until all objectives were under control several hours after the encounter, and time for reflection on the day’s events. Too, we were already in “another world” of beauty, warmth, and sunshine after our dismal, cold Pennsylvania. It never occurred to us that something “bad” could happen. We just dismissed it. Our time with my Aunt Ed continues in Part II: “Faith, Family, and Education,” as we learn more of her background and hear her artistic and creative side, which includes several of her poems. The series on Edna Gray ends, for now, with Part III: “Memories of my Parents.” As we suggested above, If you’re a Gray or Campbell family member or friend who knew Edna and have a story or anecdote to add, please respond in the section below.